On Sunday, October 14, the Day of the worker of agriculture and processing industry is celebrated in Russia. On Tuesday, President Vladimir Putin visited the Rassvet farm, where he was treated to apples and presented to him seedlings grown there. In an interview with RT, the head of the agricultural association “Stavropol Gardens” Aydin Shirinov and the governor of the region Vladimir Vladimirov told what they talked with the president about, how much success the industry has achieved and what goals they face for farmers today. We wrote about the farm of Aydin Shirinov in August. His company is one of the industry leaders. On the eve of the professional holiday of agricultural workers, Russian President Vladimir Putin visited the Stavropol region. The meeting with him was also attended by the head of the Stavropol Gardens, Aydin Shirinov. 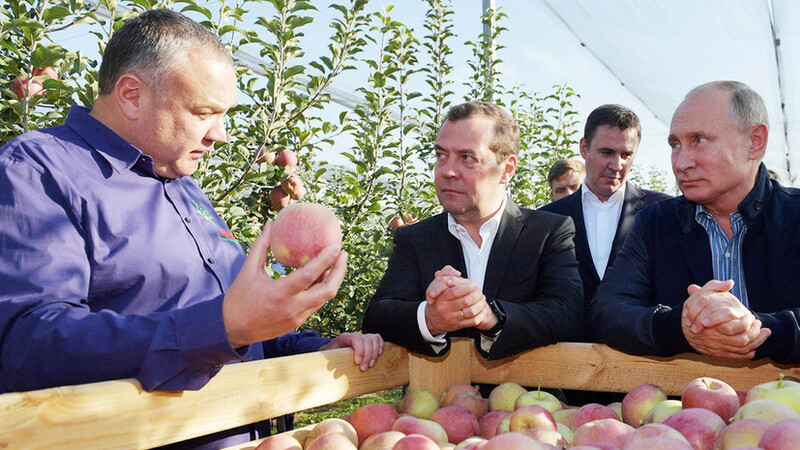 "The President is our like-minded person"
- A little more than two months ago, we discussed your farm in connection with import substitution. And literally in two months the president and the prime minister come to you. What did they say, why did your farm get interested, what was discussed, what was left behind the scenes? - In the first place, managers were interested in our results. How are the tasks they set for the government and for us, the business? And they came to "check the clock" - find out what has been done during this time. Of course, I was glad that the president saw: we were not idle, we worked and made a breakthrough. We communicate a lot with our foreign colleagues. They say it would take them a few decades, two or three minimum. In fact, all these four years we have worked at the limit, without days off and without holidays. But we are very pleased that we see the result. And the most important thing is that this result is rated by our consumers, they are satisfied. - How did you rate your farm? From a small test tube, we got the finished product, which today or tomorrow is going to the counter. And of course, this is the merit of our workers and our science and support from the government. - We, the peasants, are always few, always would like more. But those measures that have done their work. We need to go further, we need to improve them, make them targeted, without spreading across all the industries, and pinpoint the areas we need now: this is genetics, this is education. Education and science have lagged behind, they urgently need transformation and synchronization under modern technologies. And we discussed this with the president. - How do you plan to work with geneticists? - The first thing we need is a public-private partnership. Today it is not allowed to all government centers. Now we are waiting for a law giving the opportunity to create such institutions. Analogs are abroad, where genetics are engaged in the purity of the material, and the business - its replication, entering the market and getting money. And part of this money is sent back to science and moves it to those promising areas that are in demand by the market. For ten years we have been dreaming that the Ministry of Agriculture and the Ministry of Education speak the same language with us. And we are very pleased that we, at last, through disputes, insults, disagreements, but nevertheless came to this. And most importantly, the president is our like-minded person. - Does the president like apples? - He loves apples. And he discovered the secret that he is very indifferent to pears. Recently, we planted a pear orchard in Karachay-Cherkessia, the first modern pear garden in Russia. We landed about 4 hectares. And in the next two years there will be more than 20 hectares of pear in Karachay-Cherkessia. The next such project will be implemented in the Stavropol Territory. But this is not just a pear landed. We have, so to say, conceived, raised, adapted to our Russian conditions. For three years this sapling was kept in his nursery and then transplanted into the garden. They planted it in March, and this year the first harvest can be obtained. Although there were many skeptics who did not believe that it was possible to revive the direction of the pear in Russia. We will serve as an example. "Even in the tundra, you can grow something"
- Besides apples and pears, what else do you plan to launch? - Today, our fruit sector is not all mastered. We are going consistently. We would like to gain a foothold and feel confident in the apple tree. The second stage, which has already begun to develop in our country, is a pear. And the third stage is the stone fruits, which are in great demand in the south of the country, in the Krasnodar Territory, in the Caucasian republics - cherries, peaches, nectarines, cherries. Cherry today is very popular in the world. If we produce seedlings in large quantities, we can even export. The market is big. And on our example, we would like to show our nursery colleagues to be active, investors are not afraid, invest in nursery and in our science. We have different climatic zones, we have different regions. But in Russia, practically everywhere, including the tundra, something can be grown. We in the Stavropol Territory launched a project for personal subsidiary farms of ten acres: together with the Michurinsky center we developed an intensive modern gardening technology and planted about 200 plots. Imagine: everyone gets an opportunity from the Stavropol Territory to land a superintensive garden on their land for state money. The main thing - the desire and the presence of land. We plant a garden on ten acres. Exactly the same as the one where we invited the president. He was interested: "Is it only for large farms?" We said: "No, already there is for the small ones." Already have the first harvest. In the future, participants in the program (and these are mainly pensioners) will be able to collect from 8 to 12 tons of apples from ten hundred parts. At the prices of this year it is about 300-500 thousand rubles per season. - How long does it take for a tree to grow from bone to seedling, and then from seedling to the first harvest? - From bone to seedling takes about five years. From seedling to the first harvest - another two years. For example, the garden where the president was was only a year and a half. We dropped him off in the fall of 2016. And in the fall of 2018, we already had a harvest. Before fruiting - two or three years. And this tree will serve as a gardener who treats him well, for 25-30 years. But mother nature does not jump. Here science should help us. Previously, 15 years passed from the seed to the beginning of the harvest. Now we have halved this process. Seven years is a breakthrough. Governor of the Stavropol Territory Vladimir Vladimirov told RT how agriculture is developing in the region. - What was discussed at the meeting with the president? - There were many questions - both private and not private. People are worried whether support for gardening will continue. The president joked and said that we would support both kindergartens (that is, kindergartens) and gardens. - What was so interesting in the garden that the president visited? Why chose precisely fruit nursery and garden? - We need it, because today we still have not filled our market with apples by another three-quarters. That is, we consume about 13 million tons, and produce only three. - What is the effect of import substitution in the industry? - In three years we have traveled the path that other countries have been following in 30 years. Today, we are raising planting material from the cellular level and we can safely provide ourselves with apple and pear seedlings. Further, it is necessary to leave the crop production for livestock breeding, for cattle. Seed - beets, corn. For human thought and for human hands, this is a huge deal. Further, with the support of the state, develop their varieties. It is very expensive. - In the Stavropol Territory live more than a hundred nationalities. And representatives of another nationality - the South African Boers - want to join the Stavropol Territory. How does this relate to the official level? - You know, in the international agreement everything is fine. Conflicts, of course, happen. But today there is no clearly manifest interethnic intolerance. All interethnic, interfaith conflicts are derived from economic and domestic ones: someone put the car in the wrong place, someone entered someone's land, someone went into a sheep-green. If we talk about drills, it is not by chance. We were visited by the Germans, the Martens family. We arrived, settled. Today we moved to the village - they live, they are engaged in farming. The same thing happens with boers. We will meet and place any people on the territory of the Stavropol Territory. We are specifically for this purpose today we are shaping the infrastructure so that people can come, stop and look around. Yes, just see what they will do. And the Boers for us is, it seems to me, the next stage, maybe a stage. These are people who want to come and want to live with us, together with us, in peace and harmony. We have more than a hundred nationalities. We walk all along the same streets, celebrate one public holidays. And we all live in our good, dignified world. And it seems to me that any nationality that comes after seeing this world will simply want to be part of it. The rector of the Stavropol State Agrarian University, Vladimir Trukhachev, in the RT commentary, stated that the region has everything that is needed for the intensive development of the agricultural industry. - Import substitution contributes to the development of agriculture. What aspects of this process was the conversation with the president? - Today the village is not the same pit that was. There is a return, concrete, ours is not Turkish, not Egyptian, but ours. The taste of our apples is many times greater than the European and all others. Today we give our Russian consumers an apple. And this is life. Life along with vitamins. Therefore, we were very pleased with the normal, good, positive conversation of the president with our growers. Today there is no aspect that would be out of our focus. And if we talked more about crop production, then we did not go away from animal husbandry. There is already today marbled beef in our Stavropol region. In the “Rodina” collective farm of the Krasnogvardeisky district, in 14 years we bred the Dmitriev type of Hereford cattle. This is marbled beef, which is not at all inferior to English, American or Canadian today. And it is three times cheaper. - The President visited a farm that does not just grow apples, but is engaged in growing seedlings. What other saplings, besides apples, do the Stavropol Territory still need? - We would like not only pome fruits, but also stone fruits: plums, apricots, peaches. And seedlings, and gardens. Around the airport in Mineralnye Vody allocated 400 hectares today for gardens. The runway will be surrounded by a 400-hectare orchard. The city should be a garden. The edge should be a garden. Four years ago, the President held a similar meeting with us, in the Stavropol Agrarian University. So I wondered what had changed in four years. Today we looked at the issues of agriculture even more deeply. We have already gone from the essentials. Previously, she needed a loaf of bread. Previously, I needed a small piece of meat. And today we have already gone to other types of products. This suggests that in four or five years we have gone far ahead. And I believe that in the next four years the village must return its Russian glory. We have to feed Europe and half the world - and we can do it.